Mike Dell knows what he’s doing. It’s not about making money selling batteries and chargers, it’s about lawsuits from fires leaving laptops unattended. BTW the youngest self made billionaire of his time, selling chargers and batteries is chump change for him. I was hoping this would also solve the dead battery problem. Dude can u explain exactly how to do this ? Download Throttlestop , It wil bypas Processor limit . So, how do you achieve this same effect in Windows using RMClock? 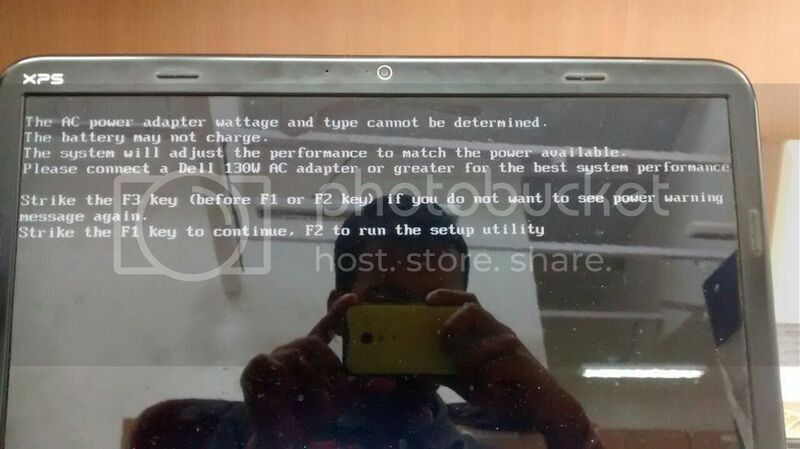 The reason that Dell do this is to limit the current consumption on the power supply and so the laptop does not to cause the power supply to fry. Similar kind of things happens now with USB chargers for tablets. Or you really know why you add this reply here or you are so naive. An alternative solution is to disable c-states and throttling in the bios. I disable this when I need to use my wife’s Dell charger, since mine is a 240 W and hers is 60 W. Works fine though. But yesterday batteries has stopped to charge. And laptop was so slow like an old android phone 🙂 Well CPU-Z showed my laptop DELL N5110 runs exactly 800 Mhz, intel boost technology does not works at all. Yes ThrottleStop helped instantly and returned me 2,9 Ghz.. wooha! But not so with batteries charging. So there should be better way return it back to life. Voltages amperages of original DELL adapter semed to be OK and DC jack was healthy. And I had chance test different DELL charger without luck. So problem was inside laptops DC part. So I disassembled apart laptop completely until was able take out DC module part completely. Sorry guys no photos but there was dirty white connector, please see this photo http://postimg.org/image/4h1pusmgn/ and there were not exactly dust, but something like oily dust. I believe there was some water or coffee incident I do not remember 🙂 Dust has colected and attached to connector pins and shorted them a bit somehow, so using strong magnifier and clean medical alcohol I carefully removed all dirt mess and cleaned contacts inside also. Please take care and think before disassembling your laptop and do it only if you trust your skills. Use only alchocol or suitable liquid for contacts cleaning! It helped me. It might help you guys. But if some dirt will be founded, magnifier is a must for proper cleaning! You, sir, are a genius! Thanks much. I am on windows 7 and have a dell 1555 laptop. Can you explain me how to do it on my system ? After a few searches in the MAXIM component database, the transistor shaped device is a UniqueWare™ Add-Only Memory, known under type DS2501, DS2502, DS2505 or DS2506. The difference is the size of the memory. The DS2501 seems to be 512 byte memory. The memory is accessed using a 1 wire communication protocol known as “1-wire”. So the DS2501 in the DELL AC Power Adapter contains the identification info of the power adapter. 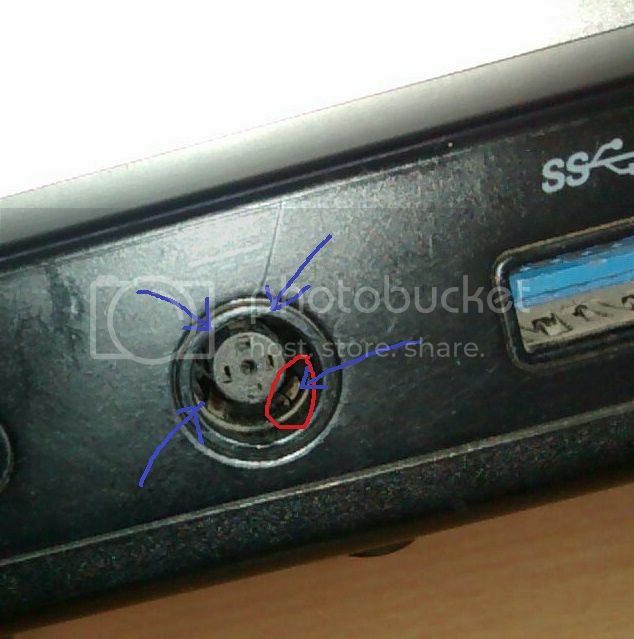 The DELL laptop reads the identification info during startup of when it’s connected while started. Power for the memory device comes from the laptop which is the same AC Adapter Identification wire, indicated as a “parasite power circuit”. Pretty nifty solution – however, it proved to be a vulnerable one, with many victims. When communication with the UniqueWare™ Add-Only Memory fails, the laptop shuts battery charging down. No battery charging” !!!!!!!! 😀 😀 😀 😀 !!!!!!! take pin, clear them and try picking them out so that they can again touch the adapter part! Fix is only to prevent the throttling. Only a new power adapter will recharge the battery. My crappy Anker only last a few months before I started getting the Unrecognized error. I had a Kensington Universal Adapter that lasted several years, yet I never saw this error. My original Dell adapter only lasted about a year. Anyway with the error, the cpu’s speed was reduced in my case by 42%. The workaround in Windows as mentioned is to use a program called ThrottleStop. Before making adjustments within ThrottleStop, find out what cpu is in your Dell laptop and figure out what are the normal speed(s) and features of that chip. Read the 1st post from the above link. According to the author, Dell will either reduce Clock Modulation (CMod) or Chipset Clock Mod (Chip). Download, install, and run ThrottleStop. From the readings, whatever is not 100% as listed on the table is what you need to check before hitting Save. In my case, the CMod reading was 75%. So, I checked Clock Modulation to stop the throttling. Also make sure the Set Multiplier Number matches your cpu. The default listed was not the proper multiplier for my cpu. After the above steps, your cpu should now run at the maximum speed. That is great except laptop cpu’s run at multiple speeds to keep things cool and extend battery life. So, you probably want to check Power Saver or SLFM if the chip supports that. Post 2 from the link will explain how to use the Windows Task Scheduler to start ThrottleStop automatically when booting. Alternatively, you could also put a shortcut in the Startup folder in Windows if you prefer. If you are going to have ThrottleStop boot everytime, you might want to go to Options and check Start Miminized, Minimized on Close, and uncheck Task Bar. These options will make Throttlestop less intrusive so you do not have to do anything everytime you computer starts. Don’t forget to click “Turn On” in ThrottleStop after making your check/uncheck choices and then Saving them. A good program to monitor your actual cpu speed is an application called CPU-Z. Download, install, run, and then minimize this program. That way, you can see what speed your cpu is running at while experimenting with ThrottleStop. In ThrottleStop, the goal is to match the power-saving and maximum speed your Dell laptop would get with a recognized adapter. In my case, the cpu is supposed to run at 800mhz at idle and 1400mhz as the top speed. You might have to experiment to get the right settings. No need to be afraid of checking or unchecking the wrong items in ThrottleStop. The worse that can happen is you set the laptop for the wrong idle and maximum speeds. You could always change it. Thanks, my inspiron 3442 now is running perfect. Hours finding a solution in internet lol. very good work of you. sorry bad english. Thanks from Brazil. So this is a fix for performance issue. Is there any fix or workaround to charge battery?? This is what i need in my life, only problem is i have no idea how to edit kernels or whatever it is you are talking about. Im not computer illiterate by any means but could anyone give me a simple guide to do this on windows 8? After a lot of web search and numerous forum threads, it was the comments here that finally put everything together and helped me solve the throttling problem on my laptop (Dell XPS M1330, T7250, with an ebay generic power adaptor). Not quite sure yet if this is the right solution but its better than having a 2.0GHz CPU be permenately throttled down to 1.2GHz. Forgot to mention that I am running Windows 8.1 and used ThrottleStop since good old trusty RMclock that have been using for ages did not seem to work for this problem. That is unless i am missing some option settings. I have an XPS15 with the i7-2630QM and was not able to get anything to work using RMclock. However, I was able to override throttling by unchecking “BD PROCHOT” in ThrottleStop. This allowed me to get full performance on AC power. I had the same problem and ThrottleStop fixed it. I had to use other options, in addition to unchecking BD PROCHOT I checked Clock Modulation, Chipset Clock Mod and Set Multiplier. Thanks to Amit and Manuel. I will kiss you on your curried little mouth! Thank you! By the way use throttlestop for win7 or 8 64 bit! BD PROCHOt took care of it immediately! This fixed it for me, too! Dell throttle my laptop to 700MHz after not recognizing the charger, but unchecking that box caused it to bounce back to full! Thanks for the tip. Thank you so much for figuring this out and sharing your solution. Exactly what I was looking for. Great! Thank you so much for this excellent piece of advice, Amit. Already four years old, but still very useful. I had experienced the CPU throttling problem with my DELL XPS M1330 laptop (Intel Core 2 Duo T7250 @2GHz, BIOS version A15). The problem happened as soon as the AC power adapter was plugged in. It is a third party adapter by the brand LAVOLTA. The CPUs would throttle to 800MHz and changing CPU frequency via software in Linux Mint 15 would not help, neither with the cpufreq suite, nor with the CPU Frequency Scaling Monitor in the Gnome panel. Note that my battery still charged normally. Setting the kernel parameter “processor.ignore_ppc=1” at startup solved the issue! Although the “ondemand” governor still sets the CPUs to 800MHz permanently, I can set the speed to 2GHz manually, for example via the “performance” governor. Interestingly, if CPU 0 uses the “performance” governor and CPU 1 the “ondemand” governor, then CPU 1 correctly scales frequencies, but not if both CPU are set to “ondemand”. Note that I am not sure whether the LAVOLTA adapter is to blame for the issue: My laptop fell on the floor a few months ago, right on the spot where the power socket sits. So it might be that the socket itself is damaged. Unfortunately, I don’t have a working DELL adapter to check this. How do I fix this problem on Windows 7? I’ve downloaded RMclock but I couldn’t figure out how to do it. There is no option in this software saying anything about ignoring the bios_limit. This fix is written for coders. Could you write a version for dummies? How do I use rmclock to ignore the bios limit in windows? I am unfamiliar with terms like FID and VID, and I have no idea what to set them to! Also is it possible to force the battery to charge in windows? rmclock doesn’t seem to be able to do it. You all sound mega tech savvy so this might be a stupid answer but i fixed mine by blowing down the end of the cable….. In Device manager uninstall microsoft AC Adaptor – unplug AC jack and then plug back. it was the simplest and easiest way to bypass that no charging and slow CPU issue. how did you get to this solution.? Unfortunately I didn’t have the same luck as nextdoor22oct. I uninstalled Microsoft AC Adaptor, followed by unplugging and plugging back the jack, but all it does is not showing the message “connected, but not charging” and the PC continue to run very slow. I did also disable an option on the Bios that allows Dell to “control” my CPU performance (I forgot the name) and it helped a little, but the performance is still far below the average. I’ll never buy a Dell product again. Followed your suggestion, and the suggestion below for setting CPU to performance, and it worked great. Thanks for figuring this out I’ve been living with a slow computer for over a year! Is there anyway do it with Windows, please I need this to be fixed, if so please give me some clear instructions. whenever using my universal car adapter (third party) for my Dell M4300 laptop I run on Dell unrecognized adapter issue (there is exact warning during laptop startup about it), so CPUs work all the time at 800MHz, which is annoying. I’m using Lubuntu / Ubuntu 11.10, 64bit. I tried solution with grub (as suggested here), adding GRUB_CMDLINE_LINUX=”processor.ignore_ppc=1? to /etc/default/grub, then update-grub but it didn’t solve the problem. and this worked, CPU’a was at 2.40GHz speed. A little issue was it was now fixed at maximum frequency all the time. current policy: frequency should be within 1.20 GHz and 2.40 GHz. current CPU frequency is 2.40 GHz (asserted by call to hardware). it sticks to 800MNz no matter CPU load ! I beg you guys for some tips on how to do it with RMclock for Windows, I don’t manage and I’m scared to do something wrong as I have deadlines for work… There are sooooo many people having this problem and working in windows (I know, I don’t have a choide), please be our hero! Thanks for the information. I tried RMclock on my Dell Latitude D610/Win XP with the power adapter problem. I couldn’t figure out how to increase the clock frequency back to the 1.73 GHz of the Pentium M processor installed. Do I play with the Target FID multiplier, with the Target VID multiplier or some other parameter? It is far too detailed and custom for my skill level. Thanks for the tip regarding RMclock – it solved the throttling issue on windows quite nicely. On a similar note, would you happen to have any insight regarding the charging issue and a possible fix on a windows 7 machine? I have had ubuntu for some time on a Dell Studio 1735 laptop with the latest bios. I have used ubuntu natty (11.04) 64-bit for two weeks and subscribe to daily updates. Last Friday, I upgraded my cpu to an Intel core 2 duo T7500 from an Intel mobile celeron dual core T1500. The T7500 has a 2.2GHz maximum cpu clock and a four times larger level 2 cache than the T1500 which has a maximum 1.86GHz cpu clock. Both cpus, T1500 & T7500, are rated 35W TDP (thermal design power). The old T1500 always ran at 1861MHz according to the Ubuntu System Profiler and Benchmark utility. Sadly, the T7500 ran at 1200MHz upon installation regardless of what applications were running. The power supply for my Dell Studio is a 65W unit. Upon first boot with the T7500 cpu, the bios reported I should be using the Dell 95W power supply. to /etc/default/grub (see http://techmonks.net/bypassing-the-dell-unrecognized-adapter-issue). Remember to update grub if you do this! current policy: frequency should be within 1.20 GHz and 2.20 GHz. This script is executed at boot. In the above case, cpufreq-set, imposes a minimum frequency, -d 1.6GHz, on each cpu core, -c 0 & -c 1, and hands control to the governor “conservative” via -g conservative. This worked great for a brief period, only for the governor to change back to “ondemand” automagically and a complete end to any frequency scaling. My laptop now responds wonderfully well to load and I have no power supply issues or over heating. Worked Great. I have been trying to find this solution for months. Don’t forget to run “update-grub” for it to take affect. Awesome, I’m gonna try this in the morning. Two quick questions. 1) this is only a fix for the speed issues right? My battery will still be unable to charge? I’m assuming this is correct, if so, is there any way to bypass THAT issue? 2) if I am running windows, but booting Linux(including grub) all off of an external hd and I still have the original MBR on the laptops hd. Will I be able to install grub without installing Linux on my harddrive? Even dual-booting is something I want to avoid on my laptop for a few reasons. Or will booting from the hd to grub, and then long-horning back to vista still load the right settings in order to bypass the speed limitations? Straighten the plug. Use silver tape or something so that the malleable part of the plug’s plastic cover is straightened out. Seems to have helped. Also, if your problem is on the laptop, not the charger, try opening your computer up and misting some lube (i.e. WD40) to the connector. Seems to help a bit. Charger is 100% dead. Upon dissection of the adapter’s corpse, it seems the metal plug is connected to the wiring via a plastic connector that’s so strong you can smash it between your thumbs. So I guess what I’d say is, following my method above will give you about a month (maybe more, maybe less… guess there’s a luck factor) of extra battery charging and no CPU nerf, but you’ll be hammering the final nail on your adapter’s coffin. 49min of battery remaining, then no computer until I buy another adapter. Guess Dell won in the end. You have literally just saved me infinite hours and money w/ the “jam it in” solution. The laptop is finally charging. Thanks so much!